Spring cleaning is the perfect opportunity to de-clutter your home, replace that old worn out furniture that you’ve had for years, and accessorize! 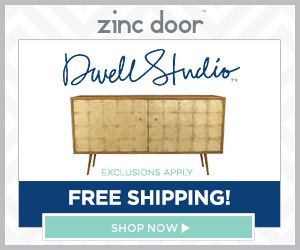 Zinc Door offers stylish and modern home decor for every room and this month they’re featuring the popular brand Noir and offering 15% off all throw pillows. The Noir Ming Bookcase provides multiple shelves and two drawers for accessories and organizational needs. This beautifully crafted bookcase will be the focal point in any room and will provide more storage space for your beloved decorative accessories, souvenirs and awards. A home office can become easily cluttered. A simple fix is to find a desk with multiple drawers. The Noir Hammered Zinc Desk is detailed with nailheads and created from hammered zinc and old wood. This timeless furnishing offers an office six drawers of chic storage. Spring cleaning also means a new wardrobe but who wants to part with their clothes from last year? The Noir Hampton Tall Boy Dresser provides six drawers which delivers maximum storage in a relaxed white washed finish. Once your space is clean and organized, it’s time to accessorize and create a spring-fresh look! Brighten up a bedroom or living space with decorative pillows. 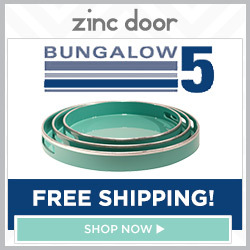 Zinc Door offers a variety of stylish pillows and from now through 4/14, Zinc Door is offering 15% off all throw pillows with promo code throws. Adding bright and colorful accessories will help any room in your home pop! I love how new throw pillows can freshen up any room. Thanks for sharing. This is a nice store, thanks for this! Thank you for that review. You just introduced me to a new place that I love! I need to check out this site so bad! That’s such a great deal. Would love to check this site out!! I need new throw pillow desperately!!! Thank you for sharing. I’m in desperate need of redecorating.